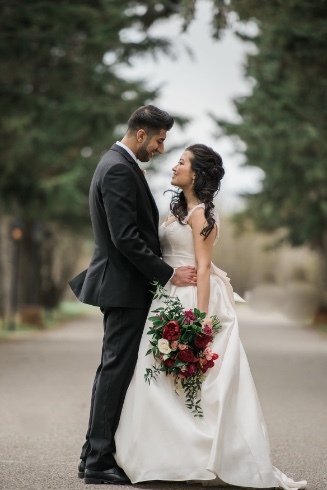 Amanda and Irfan said "I do" surrounded by 120 of their closest friends and family during a beautiful outdoor wedding ceremony at The Bow Valley Ranche Restaurant in Fish Creek Provincial Park on May 2, 2015. Amanda was a stunning bride! She chose romantic and whimsical blooms in ivory, blush, pink and marsala for her hand tied bouquet. 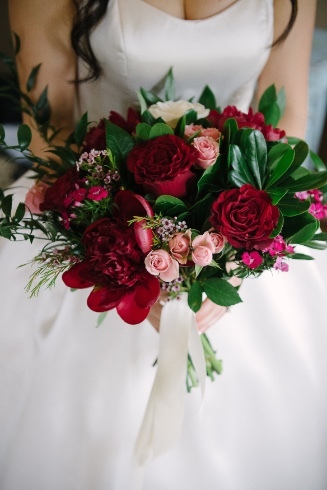 She held 'Hearts' garden roses, peonies, sweet william dianthus, waxflower and spray roses with wispy foliage for an organic looking english garden inspired bouquet. 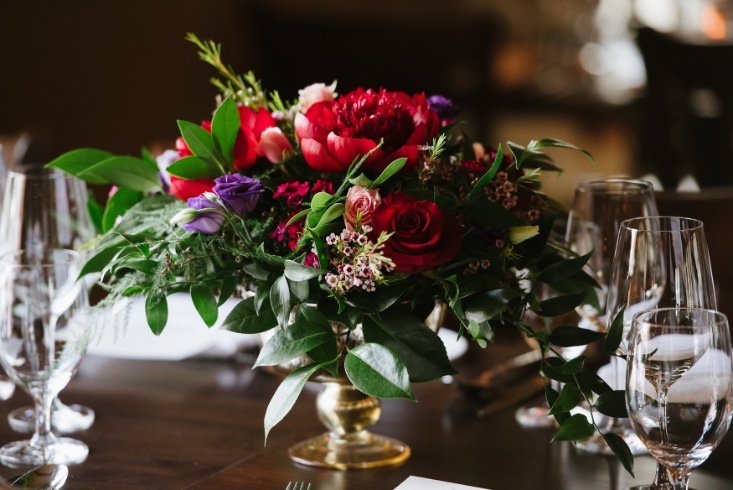 The couple's gold pedestal vase centerpieces had similar flowers with the addition of the dark purple lisianthus. 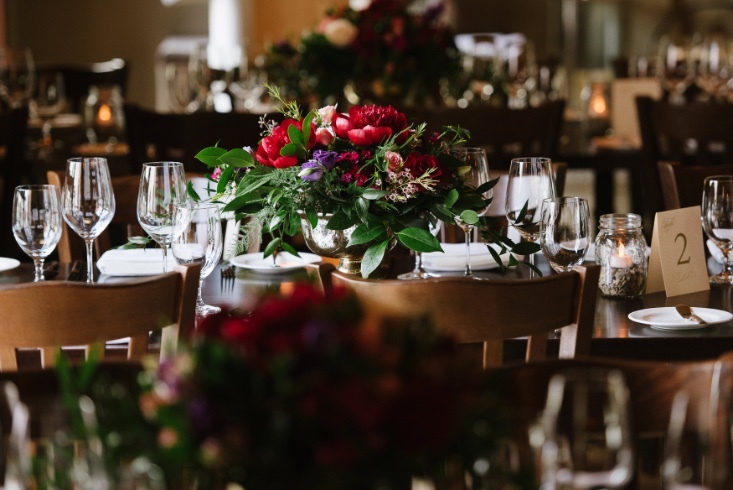 The rich coloured florals added to the romantic atmosphere already present at the Bow Valley Ranche. 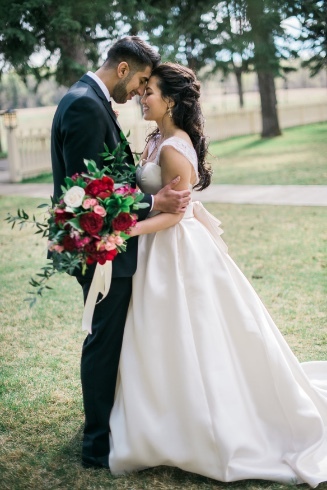 More of Amanda and Irfan's love story is featured in print in the Blush Magazine 2015 Fall Winter edition. 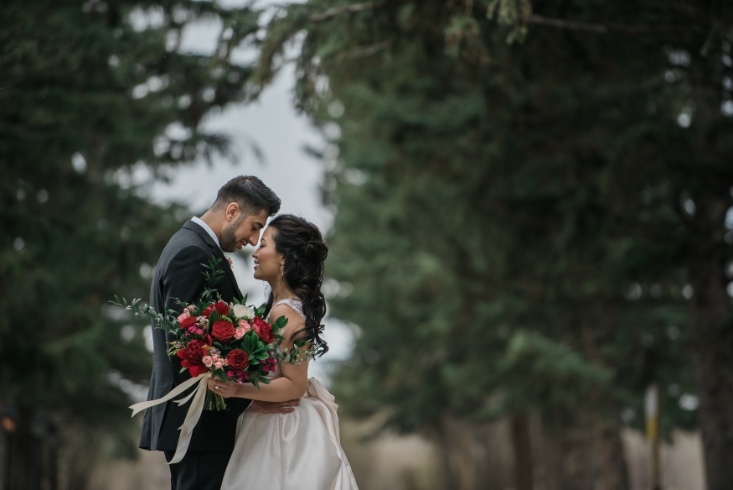 The beautiful photos were captured by Abby + Dave Photography. Flowers by Janie was honoured to be Amanda and Irfan's wedding florist. 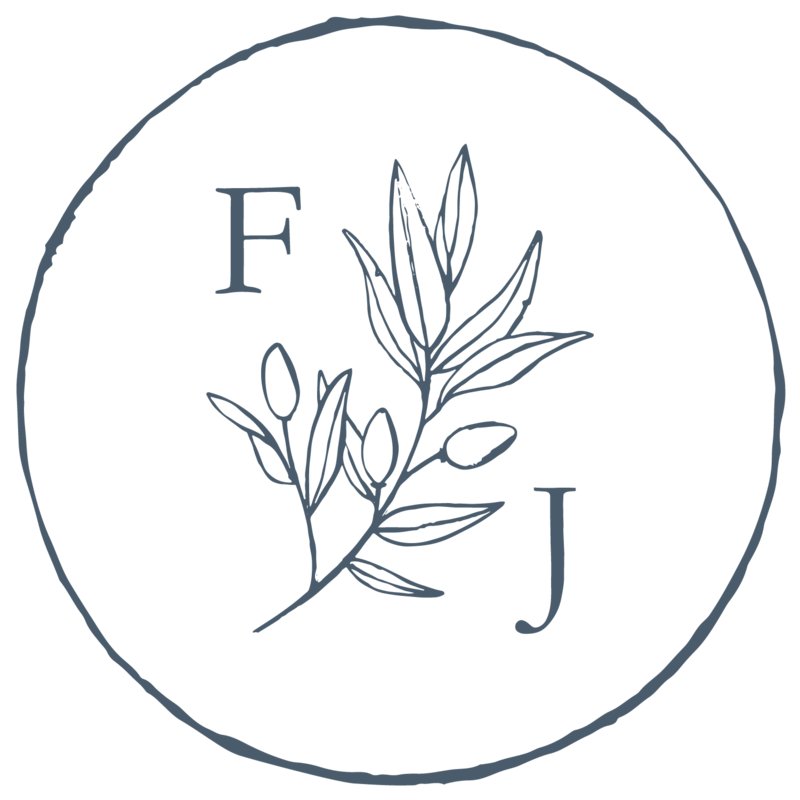 We are a boutique floral studio located in Calgary, Alberta specializing in fresh floral design for weddings and events. 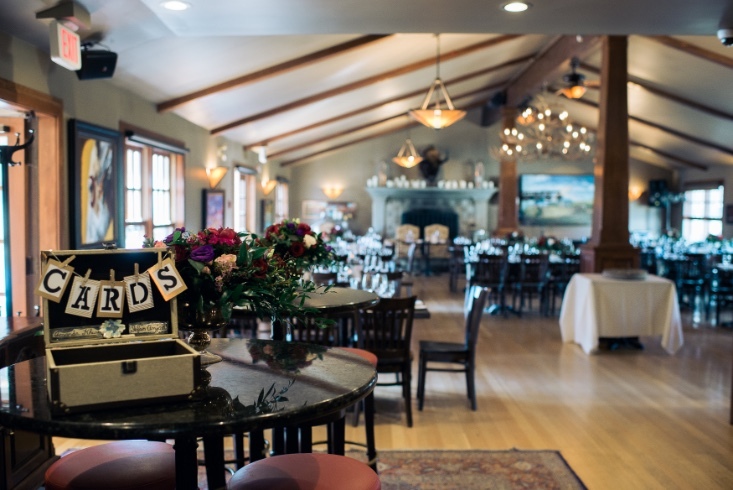 We are located minutes from the Bow Valley Ranch Restaurant and consultations are by appointment only. 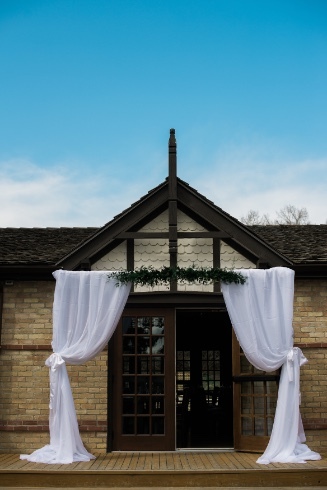 To book a consultation for your upcoming wedding please visit our website.